Lab Tools : Nano-Science, Nano-Metrology and Scientific Instrumentation and Software Design. Lab-Tools Ltd. is a micro/SME spin-off company specialising in nano-science, nano-metrology and instrumentation design. Neutron Diffraction Cryoporometry to study crystal phases. Neutron Scattering SANS & modelling techniques to measure nano-structural dimensions. USB & Ethernet interfaced NMR spectrometers based on VLSI, FPGAs and array-processing software. Peltier cooled NMR instrumentation for pore-size measurement – US Patent 14/416,409. Lab-Tools develop, operate and sell NMR Cryoporometry apparatus that is optimised to measure pore sizes, pore size distributions and pore volumes and to study materials that are structured on a 1nm to nearly 10µm length scale. Most finely porous materials are suitable for such studies, provided that a liquid can be added or is already present. This apparatus is based on wide-temperature range low-field NMR relaxation spectrometers with ultra-precise temperature control. A new generation of NMR instrumentation is nearly ready for release. Peltier or nitrogen cooled probes are also available from Lab-Tools to retro-fit industry standard NMR spectrometers, for your own NMR pore-size measurements. Background information on the Cryoporometric technique is available at www.cryoporometry.com/ . Lab-Tools performs Contract Measurements on Porous Systems for both academia and industry. Lab-Tools performs research to study the properties of liquids and their ices / gas hydrates in structured materials and at interfaces. Understanding the properties of water/ice at hydrophilic/hydrophobic and biological interfaces. Helping predict the longevity of biochar for carbon sequestration. Lab-Tools performs industrial contract analyses and also joins with other bodies such as universities to perform academic research. Lab-Tools has close ties with academics at a number of universities. Lab-Tools has successfully measured pore sizes in a wide range of porous materials, including oil and/or water wet materials. NMR Cryoporometry is one of the few techniques that can be applied to materials that can not be dried out without losing their structure. The technique is non-destructive, and can be used to follow evolution of pore structure for evolving systems. 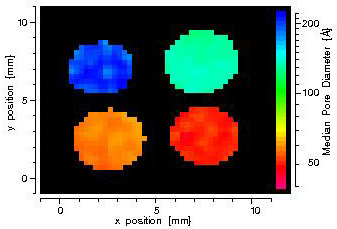 The Lab-Tools pore-size distribution measurement range extends from about 1nm to nearly 10µm. NMR Cryoporometry measures both the total pore volume and the pore volume distribution as a function of pore diameter. We frequently find that NMR Cryoporometry (NMRC) may be preferable to more established methods such as BET gas adsorption or DSC thermal porisimetry, and can now also provide information on both pore diameter and pore throat size, unlike Hg Intrusion, which just measures the pore throat. NMR Cryoporometry measurement costs are very competitive Cost per sample depends on the pore-size range to be covered, and precision needed, but goes down markedly for multiple-sample batches. Please contact Dr. Beau Webber to discuss pore size measurements on your samples. (NMR & porous media) : Emeritus Professor of Experimental Physics, School of Physical Sciences, University of Kent, CT2 7NZ. 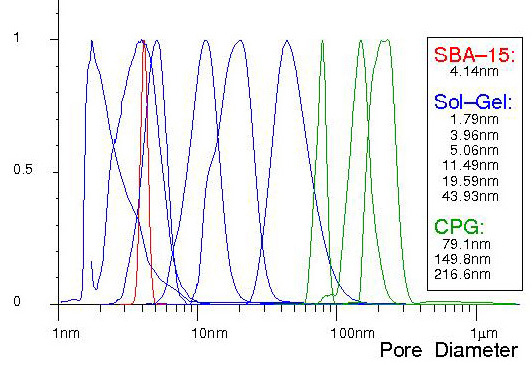 Normalised example pore size distributions, measured by NMR Cryoporometry. 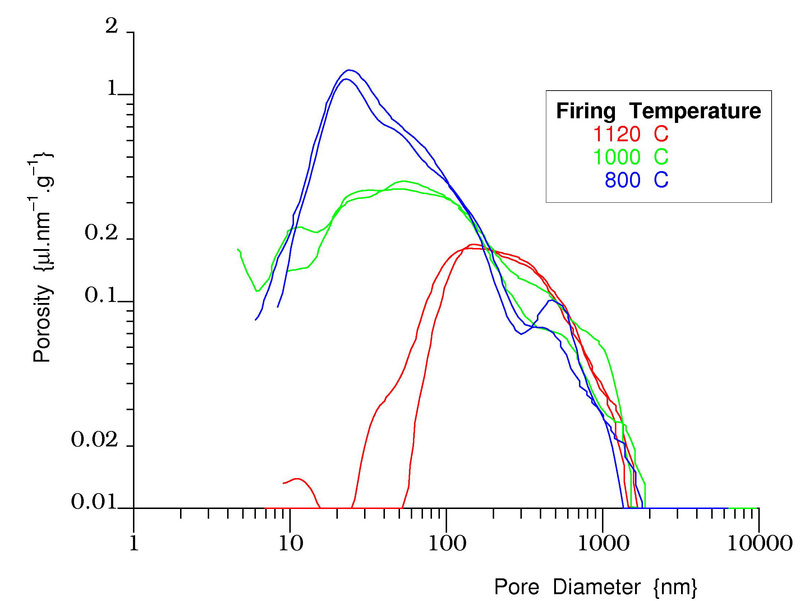 Pore size distributions for a clay fired at three different temperatures, measured by NMR Cryoporometry. 2D Resolved Pore Sizes - 4 tubes with different nano-pores, measured by spatially resolved NMR Cryoporometry. Lab-Tools is a Micro/SME spin-off from the University of Kent Physics department, but has now moved the NMR research and development laboratory to a new purpose designed facility near Ramsgate, in Kent. Lab-Tools has won a 1.188 million Euro EU FP7 grant, in conjunction with Agricultural Requisites And Mechanizations Limited, Lightmain Company Limited, Oxyguard International AS, Technosam SRL, The Nottingham Trent University and Universitat Politecnica De Catalunya. This project "Autonomous Reed Bed Installations (ARBI)" will enable the consortium to develop ecologically sound and sustainable modular reed-bed installations for purifying waste-water. Multiple nuclear magnetic resonance (NMR) installations, buried in the reed-beds, will be used to monitor their life-cycle, so that corrective action can be taken to prevent clogging and extend their life. The other Physics Reports paper was written jointly with Kent and Cambridge Universities : Review of NMR Cryoporometry, DOI: 10.1016/j.physrep.2008.02.001 . We have developed and demonstrated the first practical protocol for making 1, 2 and 3 dimensionally resolved measurements of volumetric metrology. Lab-Tools performs contract measurements for a number of national and international companies including in the construction industry and oil / well-logging industries. Our techniques are based on both physical thermodynamics and scattering techniques, and we can apply a range of NMR, X-ray and neutron scattering techniques, as well as the more conventional gas adsorption and thermoporosimetry techniques. The strength of Lab-Tools in the nano- to micro-scale field is based on a strong record of academic research, combined with extensively applied metrology, and the proven ability to implement novel measurement protocols with appropriate combinations of apparatus, hardware, firmware and software. Please do contact Dr. Beau Webber J.B.W.Webber@kent.ac.uk if you think these measurement techniques might complement your research studies. We are very pleased to be a partner in academic research, fundable by grants, to which these techniques could provide a novel insight, and leading to further publications in journals. We are also interested in extending the range of these techniques into new fields; please contact us if you have samples that you would be interested in characterising on either an academic research basis, leading to publication, or on a commercially funded basis. If you are developing a new measurement technique that requires novel apparatus, Lab-Tools can apply a powerful set of physical, mathematical and software tools to help realise this instrumentation. Scientific Instrumentation and Software Design.